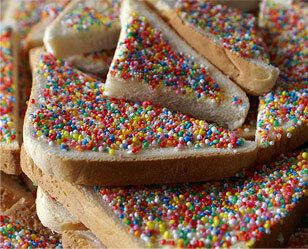 Slam Dunk Fairy Bread: Fairy bread is a hugely popular food item at children's parties in Australia and New Zealand. It consists of white bread lightly spread with margarine or butter, and then sprinkled with either sugar or colored sprinkles. Slices of the bread are typically cut into triangles and arranged on a plate. So at your next party for kids, try this hugely popular snack from down under. Provide the children with a paper plate and get them to make a picture on it using sprinkles. Give them buttered bread to slam down on to the picture and watch the sprinkles fly! You might have to do a lot of vacuuming later, but the kids will love it. DIY Mini Pizzas: This one needs little explanation, but is always a hit. Set a variety of pizza topping ingredients out on a table and let the kids decorate their own small pizzas using toast or English muffins. You can prepare them with the sauce already on them in advance, to speed things up a little and avoid the mess. The topping selection can include: pre-shredded mozzarella cheese, pepperoni (include a veg version), green peppers, onions, red olives, pineapple cubes and mushrooms. Once they've had their fun "decorating" their pizza, they can go play a game while lunch is cooking. Cupcake Challenge: Hold a "world's greatest cupcake" challenge by providing kids with fresh, plain cupcakes and a wide selection of icing, food coloring, sprinkles, candies, and all kinds of mini edibles (e.g. Smarties, chocolate chips, dried fruit, silver balls, colored sugar, minced candy bars, jelly beans, gummis, Swedish berries, licorice, etc. 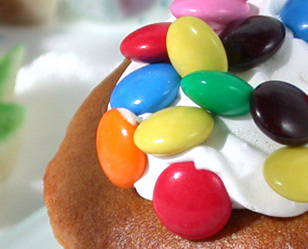 ), so that they can each concoct a majestic cupcake of their own design. If you dare, have them all set out their creations in a row for judging by their peers, though everyone wins in the end, because they get to eat what they made. Be sure to take "before" and "after" shots, as kids shove the decorated cupcakes in their mouths.